The Canyon Lake is a very unique fiberglass pool. In fact, the primary differentiator is its elevated design. Constructed to sit above ground, you’re free to construct any array of natural materials around the outside. 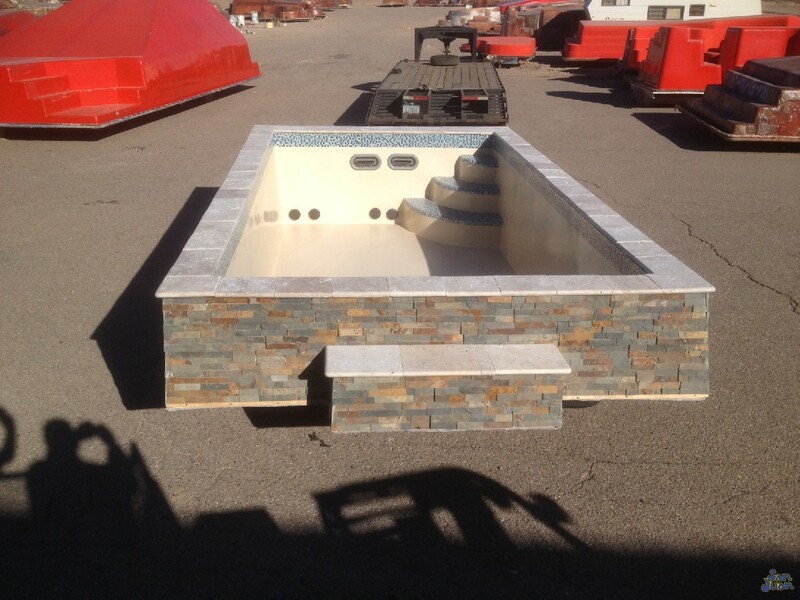 This is a great accent piece for any backyard and a showcase pool for impress friends and family. The Canyon Lake is an exceptional fiberglass swimming pool for those who want to create a unique layout for their backyard. This pool shape is in a special class, entirely of its own: Elevated Swimming Pools. This may seem like a strange concept, but there are numerous benefits to a raised pool design. 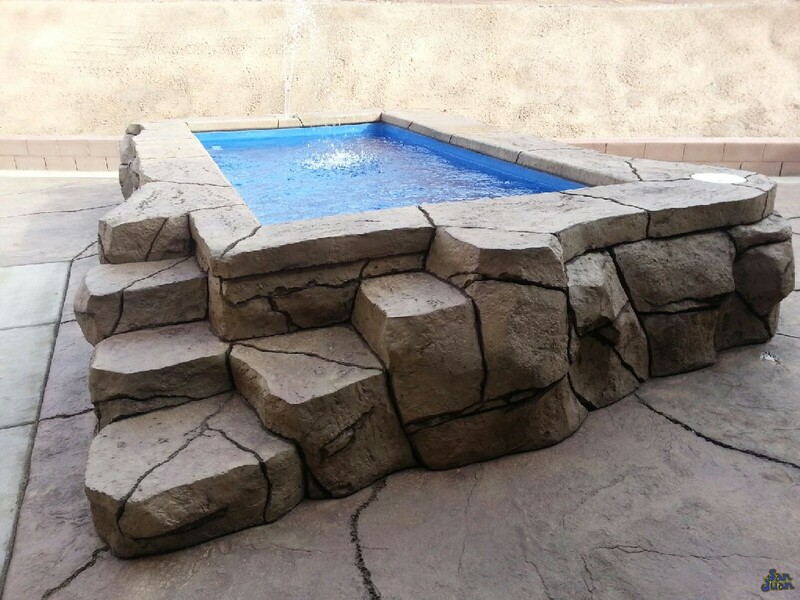 Raised swimming pools are great accent pieces for many different backyard landscapes. 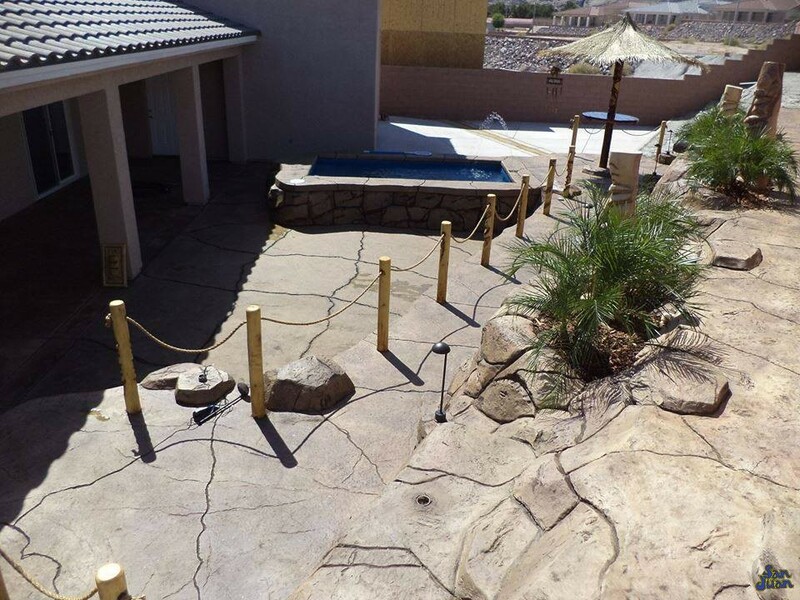 The above image showcases concrete rocks around the outside of this swimming pool. This generates a natural staircase into the pool as well as great accent features. Secondly, a raised swimming pool creates a scenic piece that is both beautiful and functional. Operate the pool as a LED light water feature or turn it into a swimming basin for outdoor fun. You’re in complete control with the Canyon Lake! By this point, your imagination might be revving up. The Canyon Lake operates in many environments and backyard landscapes. We recommend designing your own surrounding natural finishes for a earthy look. This is a great way to help your swimming pool blend with your backyard landscape. Secondly, the Canyon Lake can be installed on elevated buildings, gardens, or in wooden decks. This is your opportunity to be creative with your design approach and make it yours! In conclusion, the Canyon Lake provides many design options that are both unique and beneficial to the user. Elevated external steps provide a great way to enter and exit the swimming pool from all sides. In addition, you’re empowered to blend the Canyon Lake into nearly any outside environment. Simply dress up the sides with natural finishes (such as concrete boulders, shown above). This is a great way to enhance your outdoor living space and turn it into an outdoor oasis. Moving on, the Canyon Lake is petite swimming pool with a total pool volume of 3,500 Gallons. Able to be heated for extended swim seasons, the Canyon Lake is perfect for soaking, water therapy, relaxation & entertainment. You’ll be the life of the party with such a unique pool design and the envy of the neighborhood!